My sister is an artist. At a very young age, she stunned everyone with an amazingly accurate sketch of a horse. Eventually, she became a painting major at Rhode Island School of Design. I always joked that she got all the artistic abilities and I got none! As I grew older, I realized that my creative outlet was in the kitchen. I love to experiment and try new things, often based on flavors I think would pair well together or some random combination of ingredients that I think would taste good. Because I like to make a new recipe several ways before I share it on this site, there are many that don’t make it–at least right away. Seasonal ingredients change and I get onto new things. So, before tomato season comes and goes–and since we can get rather tasty grape and cherry tomatoes year round–I thought I would share a recent experiment. I initially set out to create a salsa of sorts for steak. When served to my extended family, everyone liked it all by itself. So, if you try my recent experiment, let me know what you think or if you tweak the recipe or use it in some other way. It’s fun to learn from each other as we try new things in the kitchen! 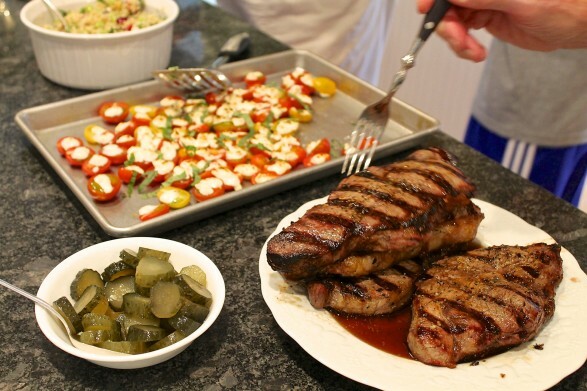 While I first crafted this easy recipe as a seasonal topping for grilled steaks, my family enjoys it as a side all by itself. It is also quite good stirred into cooked couscous, rice, or quinoa. Simply drizzle with olive oil and a splash of balsamic vinegar, add additional fresh basil, and season to taste. In a mini chopper, food processor or blender, blend the feta, yogurt, and pepper until smooth. Depending on your appliance, small quantities may be hard to blend without scraping down the sides many times. You may also work into a smooth paste by hand. A little buttermilk would be an acceptable option to the yogurt. 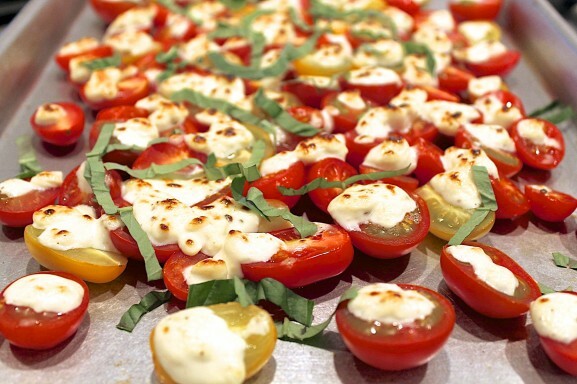 Place the tomatoes, cut sides up, on a lightly greased baking sheet with sides. Spoon the feta mixture over the tomatoes, trying to keep most of it on the tomatoes. The globs that fall on the sheet will bake to a golden brown and taste delicious, too. Place in the oven and, watching carefully, broil until the feta topping is golden brown. Sprinkle with the basil and serve. On the Healthy Kids Child Wellness and Weight Management Program, I am always looking for delicious ways to get more veggies into reluctant kids. I am sure this is one! Thanks! My pleasure, Jennifer. Thank you for the comment! Hi Ann! I have some grape tomatoes in my fridge I need to use, and I think I just found the simple recipe for them. This looks so yummy! I would love to know what you think of my latest experiment, Mary Lou!